It is a staple food, made from a selection of locally available foodstuffs that can be prepared in a distinctive way, such as fruits de mer, served along the west coast of France. It contains a particular 'exotic' ingredient that is produced locally, such as the South American paprika grown in the European Pyrenees. It is served as a festive culinary tradition that forms part of a cultural heritage—for example, barbecues at summer camp or fondue at dinner parties—or as part of a religious practice, such as Korban Pesach or Iftar celebrations. It has been promoted as a national dish, by the country itself, such as the promotion of fondue as a national dish of Switzerland by the Swiss Cheese Union (Schweizerische Käseunion) in the 1930s. National dishes are part of a nation's identity and self-image. During the age of European empire-building, nations would develop a national cuisine to distinguish themselves from their rivals. According to Zilkia Janer, a lecturer on Latin American culture at Hofstra University, it is impossible to choose a single national dish, even unofficially, for countries such as Mexico, China or India because of their diverse ethnic populations and cultures. The cuisine of such countries simply cannot be represented by any single national dish. Furthermore, because national dishes are so interwoven into a nation's sense of identity, strong emotions and conflicts can arise when trying to choose a country's national dish. In Latin America, dishes may be claimed or designated as a "plato nacional", although in many cases, recipes transcend national borders with only minor variations. Both Peru and Ecuador claim ceviche as their national dish. Stews of meat, plantains, and root vegetables are the platos nacionales of several countries in Central America, South America, and the Caribbean: Colombian ajiaco, as well as the sancocho of the Dominican Republic, Colombia, and Panama, are examples of platos nacionales. Janer (2008) observes that this sharing of the same plato nacional by different countries calls into question the idea that every country has a unique national dish that is special to that country; she states that cuisine does not respect national and geopolitical borders. The identification of Latin American national dishes is stronger among expatriate communities in North America. In Latin American countries, the plato nacional is usually part of the cuisine of rural and peasant communities, and not necessarily part of the everyday cuisine of city dwellers. In expatriate communities, the dish is strongly reclaimed in order to retain the sense of national identity and ties to one's homeland, and is proudly served in homes and restaurants. By this show of national identity, the community can resist social pressures that push for homogenization of many ethnically and culturally diverse communities into a single all-encompassing group identity, such as Latino or Hispanic American. This is not a definitive list of national dishes, but rather a list of some foods that have been suggested to be national dishes. India: No national dish; however, the most recognized dishes are Khichdi, Samosa, Tandoori Chicken, Dal makhani and Rogan Josh. 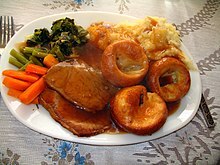 A Sunday roast—in this example, mashed potatoes, vegetables is a national dish of the UK - the addition of mini Yorkshire puddings here mark this variation as specifically English. A national liquor is an alcoholic drink considered a standard and respected adult beverage in a given country. While the status of such drinks may be informal, there is usually a general consensus in a given country that a specific drink is the national beverage or "most popular liquor". 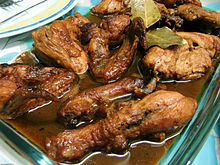 ^ a b c d "Top Ten National Dishes". National Geographic Magazine (Travel section). Retrieved 6 March 2013. ^ a b c d e Zilkia Janer (2008). Latino food culture. Food cultures in America. ABC-CLIO. pp. 71–73. ISBN 9780313340277. ^ Howes, David; Lalonde, Marc (June 1991). "The history of sensibilities: Of the standard of taste in mid-eighteenth century England and the circulation of smells in post-revolutionary France". Dialectical Anthropology. 16 (2): 125–135. doi:10.1007/BF00250241. ISSN 0304-4092. ^ "Kabuli Pulao With Raisins And Carrots". Retrieved 15 August 2011. ^ "Food in Algeria: Algerian Food, Algerian Cuisine". Retrieved 15 August 2011. ^ "El asado". Archived from the original on 3 December 2013. Retrieved 25 February 2012. ^ "Cautious change to Australia's 'national dish'". Retrieved 23 September 2018. ^ "Our greatest Aussie recipes". Retrieved 5 June 2011. ^ "National Dishes & Local Favorites from the Islands of the Caribbean". Caribbeanamericanfoods.com. Archived from the original on 22 June 2010. Retrieved 4 July 2010. ^ "A Bengali bounty". Retrieved 4 June 2011. ^ Barbados National Dish: Coucou & Flying Fish Archived 2011-06-16 at the Wayback Machine. Epicurian Tourist. 25 December 2007. Retrieved 21 January 2011. ^ Tom Masters (1 October 2009). Europe on a Shoestring. Lonely planet. ISBN 978-1-74104-855-1. Retrieved 15 July 2010. ^ "National Dish - Hispanic Food throughout the World". Retrieved 18 April 2014. 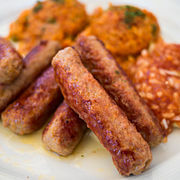 ^ "Bosanksi Lonac – Bosnia & Herzegovina National Dish". Archived from the original on 18 November 2010. Retrieved 18 September 2010. ^ "Feijoada recipe, Eat brazilian!". Copacabana Info. Retrieved 8 July 2010. ^ Bahrum Ali (21 February 2009). "Fostering family ties with ambuyat feasts". The Brunei Times. Archived from the original on 4 April 2014. Retrieved 5 April 2014. ^ Jessica Tiah (8 January 2011). "Ambuyat - Our iconic heritage". The Brunei Times. Archived from the original on 4 April 2014. Retrieved 5 April 2014. ^ "Khmer Foods". Tourism of Cambodia. Retrieved 8 August 2014. ^ "Cambodia Food and Drink". Asiaview. Retrieved 8 August 2014. ^ Chapman, Sasha (September 2012). "Manufacturing Taste". The Walrus. Retrieved September 1, 2012. ^ Florence Fabricant (14 April 2009). "For Chileans, Passion Translates to Empanadas". New York Times. Retrieved 12 March 2014. ^ Rick Lundstrom (31 December 2013). "Classic duck dish now on Air China". ^ Mary Bai (27 September 2011). "Peking Roast Duck, China's National Food". Archived from the original on 12 March 2014. ^ "Top Five Macanese Dihes". Archived from the original on 2011-10-01. ^ "POBREZA, DESARROLLO Y SALUD|1999-12-01". Retrieved 2 February 2011. ^ a b "The Independent - 404". The Independent. Retrieved 17 April 2015. ^ "Official results page of the Danish national dish competition". The Danish ministry of food. 20 November 2014. Archived from the original on 18 October 2014. Retrieved 21 November 2014. ^ "El Encebollado | Montañita - Ecuador". Montanita.com. 9 May 2012. Retrieved 3 October 2013. ^ Publicado por Belénchis. "Ruta De La Fritada: Historia De La Fritada". Rutadelafritada.blogspot.com. Retrieved 3 October 2013. ^ "la guatita ecuatoriana". 19 December 2008. Retrieved 3 October 2013. ^ "Food in Egypt". Retrieved 15 August 2011. ^ Orson, Lucy (2 July 2000). "192-Part Guide To The World: Eritrea". The Independent. London. Retrieved 15 August 2011. ^ "Food in Ethiopia". Retrieved 15 August 2011. ^ "National dish of Finland". National-food.info. Retrieved 17 September 2014. ^ "Four Nations Where Forks Do Knives' Work". New York Times. 18 February 2004. Retrieved 6 July 2011. ^ a b "Food Journeys of a Lifetime: Top Ten Great National Dishes". Away.com. Retrieved 3 October 2013. ^ "Famous French Food". Classic French Food. Retrieved 7 July 2010. ^ "What's On The Menu? : Germany's Favorite Dishes". German Foods. Archived from the original on 7 July 2010. Retrieved 8 July 2010. ^ Eleanor B. Pierce (1968). Menu Translator: Pan Am's Guide to Food and Drink Specialties Abroad and at Home. p. 76. ^ Fodor's 89 Germany. 1989. p. 70. ^ Charles Sinclair. Dictionary of Food: International Food and Cooking Terms from A to Z. A & C Black. p. 324. ^ "Moussaka: The National Dish of Greece". Greecelogue. Retrieved 8 July 2010. ^ "Top 10 National Dishes". Terrific Top 10. Retrieved 17 April 2015. ^ "Oil down: National Dish of Grenada". Gov.gd. 5 March 2010. Retrieved 3 October 2013. ^ a b c d e Media, Kompas Cyber. "Kemenpar Tetapkan 5 Makanan Nasional Indonesia, Ini Daftarnya - Kompas.com". KOMPAS.com (in Indonesian). Retrieved 2018-04-18. ^ "A Soto Crawl". Eating Asia. Retrieved 5 July 2010. ^ a b Sara Schonhardt and Melanie Wood (15 August 2011). "40 of Indonesia's best dishes". CNN Travel. Retrieved 6 July 2014. ^ Chef Daeng. "Satay Washington DC". satay.com. Retrieved 6 July 2014. ^ Nadya Natahadibrata (10 February 2014). 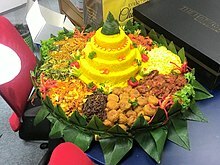 "Celebratory rice cone dish to represent the archipelago". The Jakarta Post. Retrieved 9 July 2014. 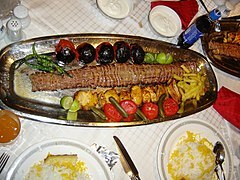 ^ "Chelo Kebab Recipe, Middle Eastern food". About.com. Retrieved 7 July 2010. ^ Beeston, Richard (27 June 2007). "Imams put fatwa on carp caught in Tigris". London: The Times. Retrieved 11 July 2010. ^ "Italy urged to go on pasta strike". BBC. 13 September 2007. Retrieved 8 July 2010. ^ "Polenta". Retrieved 5 June 2011. ^ a b "Food Journeys of a Lifetime: Top Ten Great National Dishes". Away.com. 9 October 2010. Retrieved 3 October 2013. ^ "Traditional Dishes of Japan". Japan National Tourism Organization. Retrieved 24 June 2014. ^ 『カレーライス』に関するアンケート (in Japanese). ネットリサーチ ディムスドライブ. Retrieved 16 October 2008. ^ McCurry, Justin (18 June 2010). "Ramen: Japan's super slurpy noodles". The Guardian. London. Retrieved 5 June 2011. ^ "Jordan National Dish, Mansaf: Waleg Kitchen". Waleg.com. Retrieved 3 October 2013. ^ Business Optimization Consultants B.O.C. "Jordan: Jordanian Cuisine". Kinghussein.gov.jo. Retrieved 3 October 2013. ^ Parkinson, Tom; Phillips, Matt; Gourlay, Will (2006). "Kenya". ISBN 9781740597432. ^ Williamson, Lucy (4 February 2014). "Kimchi: South Korea's efforts to boost its national dish". BBC News. Retrieved 20 May 2017. ^ Govender, Serusha (6 May 2014). "10 National Dishes Around the World". The Daily Meal. Retrieved 20 May 2017. ^ Jeffery, Nicole (20 May 2017). "Pyeongchang Winter Olympics: the next cool spot". The Australian. Retrieved 20 May 2017. ^ Web Desk (7 February 2017). "National Dishes of the World". PKKH. Retrieved 20 May 2017. ^ "Thailand". Encyclopedia Britannica. Retrieved 17 April 2015. ^ "About Thai food". tourismthailand.org. Archived from the original on 9 June 2014. Retrieved 17 April 2015. ^ Clements, Miles (28 October 2010). "The Find: Tom Yum Koong". Los Angeles Times. ^ "A Taste of Sticky Rice, Laos' National Dish | Travel | Smithsonian Magazine". Smithsonianmag.com. Retrieved 3 October 2013. ^ "The national dish of Lebanon". Sourat.com. Archived from the original on 13 September 2012. Retrieved 3 October 2013. ^ Boissard, Pierre (1997). Cuisine Malgache, Cuisine Creole. Antananarivo: Librairie de Tananarive. pp. 36–40. ^ "Mole Poblano: Mexico's National Food Dish". Mexonline. Retrieved 11 July 2010. ^ Nina Terrero (11 September 2012). "How to make: Traditional Mexican favorites". NBC Latino. ^ "Montenegro Crna Gora Montenegro". Montenegro.org.au. Retrieved 3 October 2013. ^ "Food in Morocco - Moroccan Food, Moroccan Cuisine - popular, dishes, recipe, diet, history, common, meals, staple, rice, famous, main, people, favorite, make, customs, fruits, country, bread, vegetables, bread". foodbycountry.com. Retrieved 17 April 2015. ^ "DAL BHAT". Retrieved 11 July 2010. ^ "Bacon & Egg Pie". Retrieved 5 June 2011. ^ "Tender, loving care for lamb". Retrieved 5 June 2011. ^ "How to make Egusi soup". Retrieved 18 January 2016. ^ "Beef Nihari". Retrieved 11 July 2010. ^ "Ceviche – the Peruvian national dish". Peru Travel Guide. Archived from the original on 7 June 2008. Retrieved 11 July 2010. ^ DeWitt, Dave (2010). 1,001 Best Hot and Spicy Recipes. Agate Publishing. p. 428. ISBN 9781572841130. ^ Sifton, Sam (5 January 2011). "The Cheat: The Adobo Experiment". The New York Times. Retrieved 5 June 2011. ^ Alison Mutler (17 February 2014). "EU agrees to open its grills to Romania's national sausage". Vancouver Sun. Archived from the original on 19 May 2014. ^ Food in Motion: The Migration of Foodstuffs and Cookery Techniques : Proceedings : Oxford Symposium 1983. Oxford Symposium. 1983. p. 62. ISBN 978-0-907325-16-1. ^ Encyclopedia Britannica (2002). The New Encyclopedia Britannica. 1. Encyclopedia Britannica. ISBN 978-0-85229-787-2. ^ "Serbian cuisine". TravelSerbia. Retrieved 9 August 2010. ^ a b c Laurence Mitchell (2010). Serbia. Bradt Travel Guides. p. 79. ISBN 978-1-84162-326-9. ^ "Gibanica, a pie like no other". serbia.com. Retrieved 21 March 2013. ^ "Fall Brings Red Peppers and Ajvar, 'Serbian Salsa'". NPR. 8 November 2006. 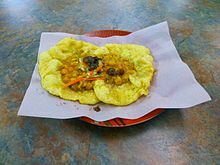 ^ "The quest for Singapore's next national dish". CNN. 26 January 2010. Retrieved 7 July 2010. ^ Kugiya, Hugo (18 March 2010). 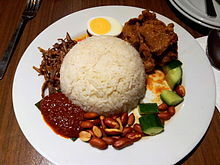 "Singapore's national dish: Hainan chicken rice". Crosscut.com. Archived from the original on 31 August 2011. Retrieved 3 October 2013. ^ "National Food". Slovak Republic. Retrieved 1 August 2010. ^ Kronenthal, Melissa (1 May 2010). "Spain's tortilla de patatas is simply satisfying". The Seattle Times. Retrieved 18 May 2011. 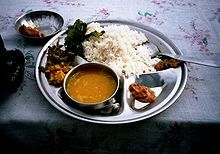 ^ "Sri Lanka Food Rice & Curry". Retrieved 18 May 2011. ^ a b "Food and Drink in Sweden: Sweden Travel Guide". Swedentravelnet.com. Retrieved 3 October 2013. 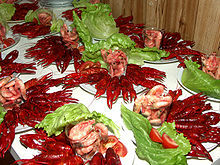 ^ "The crayfish party". Sweden.Se. Retrieved 3 October 2013. ^ "Motion 2004/05:K378 Ostkaka som Sveriges nationalrätt" (in Northern Sami). riksdagen.se. Retrieved 3 April 2014. ^ John Tagliabue (3 February 2008). "Swiss Sausage Fans Fret Over How to Save Their Skin". The New York Times. ^ "Tanzania: 3 FOODS OF THE TANZANIANS". Advameg, Inc. Retrieved 25 March 2013. ^ "Typical Thai Meals & Eating Habits". Bangkok.com. Retrieved 7 July 2010. ^ "National Dishes & Local Favorites from the Islands of the Caribbean". Caribbeanamericanfoods.com. Archived from the original on 4 October 2013. Retrieved 3 October 2013. 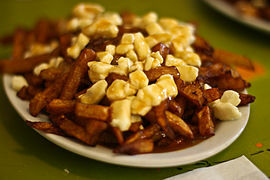 ^ "NATIONAL DISHES OF THE WORLD - GUTSY GOURMET". thegutsygourmet.net. Retrieved 17 April 2015. ^ Elizabeth Taviloglu. "Navy Bean Stew Is Turkey's National Dish". turkishfood.about.com. Retrieved 12 March 2014. ^ "Fish and Chips," in Fast Food and Junk Food: An Encyclopedia of What We Love to Eat (2011). Ed. Andrew F. Smith. ABC-CLIO p. 258 . ^ Darwin Porter and Danforth Prince, Frommer's England 2011: With Wales (2010). John Wiley & Sons: p. 163. ^ Heston Blumenthal, In Search of Total Perfection (2010). Bloomsbury: p. 205. ^ Fish and Chips, Historic UK. ^ Yee Chiang, The Silent Traveller in London (1939). Interlink: p. 157. ^ Peter Earle. The Making of the English Middle Class: Business, Society and Family Life in London 1660-1730 (1989). University of California Press: p. 279. ^ Cassell's Dictionary of Cookery (1883), p. 137. ^ About Plum Pudding, Everyday Housekeeping: A Magazine for Practical Housekeepers and Mothers (Vol. 13-14), p. 97. ^ "Ireland: Ulster Fry (March 10, 2008)". European Cuisines. 10 March 2008. Retrieved 3 October 2013. ^ Sari Edelstein. Food, Cuisine, and Cultural Competency for Culinary, Hospitality, and Nutrition Professionals (2010). Jones & Bartlett : p. 118. ^ Lesley Anne Rose, Michael Macaroon, and Vivienne Crow. Frommer's Scotland (2012). John Wiley & Sons: p. 28. ^ "Welsh national dish". Foodmuseum.com. Archived from the original on 15 July 2010. Retrieved 4 July 2010. ^ "Cuisine of Uzbekistan. Uzbek national dish :: Plov". Orexca.com. Retrieved 3 October 2013. ^ "Welcome to Uzbek National Cuisine!". Uzbekcuisine.com. Retrieved 3 October 2013. ^ "Fettuccine alla papalina (Fettuccine for the Pope)". yummly. 6 July 2009. ^ "Venezuelan Cuisine: Vanezuelan National Dish (Pabellon Criollo Con Barandas)". Chowtimes.com. 22 May 2010. Retrieved 7 July 2010. ^ "Pho: national dish, international obsession". Vietnews Online. 14 February 2010. Archived from the original on 1 March 2010. Retrieved 7 July 2010.